Summer Scouting | KB Outdoors, Inc.
With the fall hunting season just around the corner that means only one thing….. summer scouting! As you may have deduced from that statement scouting is in full swing here at KB Outdoors, we wanted to take the time today to give everyone some tips and tactics we use as well as debunk a couple myths about scouting. So what are the main tactics used by us you might ask? Glassing areas and using a Phoneskope, trail cameras, patterning, finding water sources/elk wallows, finding the Cow elk and Does, taking inventory on summering male animals. So lets start with the first part which is glassing and using the Phoneskope attachment. Glassing from a high vantage point overlooking many open parks meadows or whatever is in your area is probably the second most effective scouting tool one can use. By glassing from a high vantage point in your area this allows you to look over as much country as possible and see how the animals react in various areas as well as their tendencies in certain areas. Now we can wrap this into the myth part i spoke about earlier. Wherever you find some of these target animals in summer locations is not by any means where they will be when your season rolls around. Especially when it comes to elk, in our experience whatever bulls you find in the summer areas only about 50-60% of them actually remain in the general vicinity of where you find them in the summer months. This however is where we start our next point of finding cow elk and does. As a general rule of thumb cow elk and doe deer typically stay in their summer areas until significant weather events push them out of the area. Which can vary widely from location to location as some places see snowfall early where other might not see it until all the seasons have concluded. So what makes finding the girls important especially when it comes to elk is you know know where the rut is going to kick off at. Cows and calves dont move very fast especially in large herd so that’s why we say the general rule of thumb usually holds true every year. this is where the inventory and patterning comes in. By taking inventory of whats in your hunting area you allow yourself to make a list of animals you would like to pursue when the season finally rolls around. As i already stated for the elk it allows you too see what bulls are in the area. Even though as we said only 50-60% will remain you’re still going to have the opportunity to keep an inventory of everything and then formulate an attack plan later. When it comes to patterning what we focus on very hard in the summer months is patterning mule deer for the archery season. 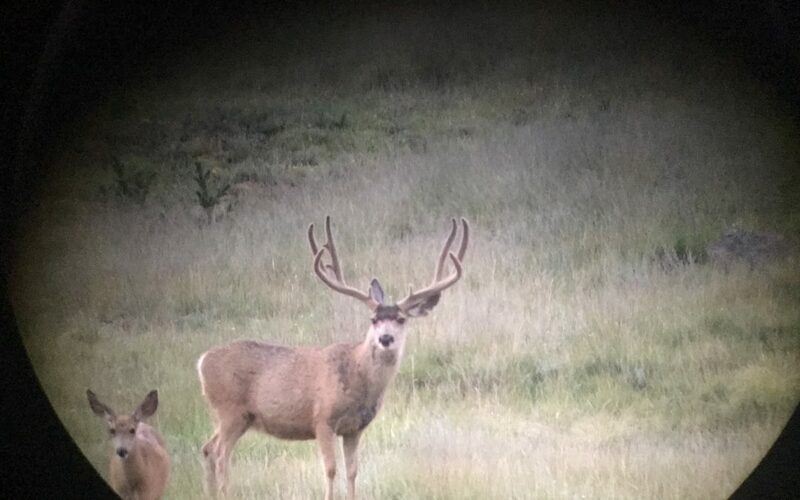 This year the Colorado archery season opens August 25th, and with that still being in the heart of summer it makes the mule deer bucks very pattern able. in our opinion the best time to kill a big trophy mule deer is in the archery season. By our experience this is the time of year they are most vulnerable and the most pattern able until mid September when the velvet comes off that is. When that velvet finally strips its like a light bulb just flips on and they become ghosts. On a year like this where most of the west has been abnormally dry finding water sources are key to fall success. Regardless of anything else all animals must have water. Water sources are not always easily defined either such as a pond, stock tank, creek or river. Animals seem to have a keen sense on being able to find very obscure water sources such as small springs hidden deep in canyons or secluded in dark timber patches. Your job now is to in turn find these obscure water sources and keep an eye on them. Which brings us around to our final point and perhaps the most effective scouting tool… Trail cameras. Trail cameras are hands down no argument the single most effective scouting tool in today’s modern hunting world. If i tie this back into the water source point, what makes them so effective is you can set up a camera on a water source and now have a way to keep an eye on that water, scout for animals in the area, take inventory of bucks and bulls and also pattern the animals as well. On a dry year like this i can almost guarantee you that what ever animals you find in your area will continue to use that water source throughout the fall. So how does this relate to trail cameras? well it pretty simple you now have a tool to scout an area without being present there 2-3 times a week. Using trail cameras allows you to scout a lot of areas without having to physically be there. this in turn allows you to get to those high vantage points and glass the areas where trail cameras are not exactly effective due to the expanse of area the animals roam. See how all this has come full circle now ? These are the main tools, tactics and methods we use to scout in the summer to make ourselves better prepared for the fall. Preference Points are a Must for Big Game Hunting in Colorado! Welcome to the All-New KB Outdoors, Inc. Website!